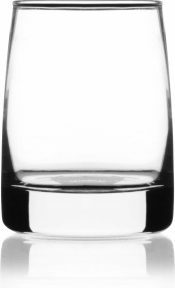 A modern take on a classic cocktail glass, the Vibe has a slender profile but heavy base for a classy feel. These come in 10 or 12 ounce sizes, perfect for any size pour, neat or rocks. 12 per case. Talk to the experts at DejaBrew today about designing and then deep etching your logo on every piece, for a low-key upscale presentation.